City, State, Country: New York, New York, U.S.A.
My love for the outdoors began about ten years ago, while I was living in Northern California. Most of my hiking experience includes day hikes with an occasional 2-3 day backpacking trip. I'd consider myself an all season hiker and generally like to keep my pack as light as reasonably possible. I am currently living in New York City. I've hiked in various parks in several states and countries and enjoy hiking in various terrain, but prefer mountainous terrain for the vistas and views, and enjoy forest/river hikes for the scenery. The Outdoor Research Lightweight Dry Sack, hereinafter, referred to as "the sack", is advertised as being lightweight, completely waterproof, and tear-resistant. The sack is manufactured with Outdoor Research's patented Barrier Fabric, which the company advertises as a durable, coated nylon fabric that is highly packable and extremely waterproof. The packaging in which the sack arrived describes the seams as being waterproof and describes the closure as a secure roll-top closure which creates a waterproof seal. The package also states that the fabric is non-breathable. 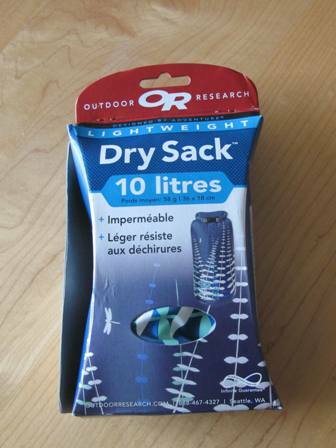 The 10L (610 cu in) dry sack arrived with the standard manufacturer's packaging as shown. The cardboard box measured 8.25 x 4.25 x 2 inch (21 x 10.8 x 5 cm). The package is in both English and French and also states that there is a lifetime warranty on the product, and that the product is PVC-free. PVC is a known carcinogen contained in many synthetic manufactured plastic products. The product description also states that the sack is not intended for prolonged submersion or for the storage of electronics. 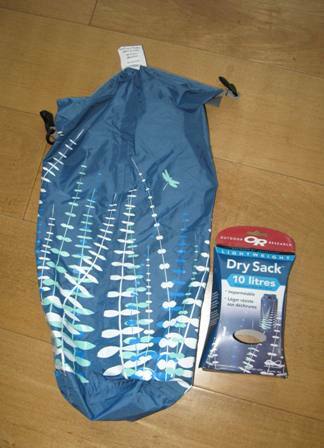 I received the dry sack in the original packaging shown above. My first impression of the dry sack was that it was small and extremely lightweight and felt a little flimsy in comparison to another Outdoor Research waterproof dry bag which I own, that is made of a rubberized material and is much heavier in weight. I was wondering what I could fit in to such a small bag, and was wondering if the bag could be truly durable and waterproof. The first thing I did was to see how much capacity the 10L (610 cu in) dry sack had. I emptied the entire contents of my weekend duffle and surprisingly the sack was able to fit all of my clothes which included 3 tank tops, a pair of hiking pants, 1 pair of shorts, a skirt, a long sleeved t-shirt, 3 sets of undergarments, a bathing suit, and 2 pairs of socks, with some additional room to spare. The 10L (610 cu in) size is perfect for storing clothing and other personal items for a 2-3 day trip. It is also a great size to tie onto the back of my kayak, fit inside the cockpit with me without taking up too much space, or using it as a storage compartment to organize belongings inside of a backpack while on 2-3 day trips. I examined the taping over the seams on the interior of the sack which provides waterproofing and will determine during the testing process if there is any leakage from the seams. The nylon fabric seemed to be durable and at first sight the plastic buckle and closure seal seemed somewhat flimsy. However, after loading the bag, following the instructions to purge the air, rolling the seal down three times, then snapping buckle shut and fastening the sack to the hatch of my kayak, I felt that the overall design and construction would work for its intended use. Since my sack was now packed and fastened to the outside of my kayak, I decided to take it for a short 2.5 hour test ride on Lake Zoar before I sat down to write this report and I must say, I was very pleased. Lake Zoar is a section of the Housatonic River that is dammed on both ends, and the flood gates were not open so there was little current and wind in this initial test run. The sack, being strapped to the outside of the kayak, was subject to spashing from normal paddling, and riding the waves of passing motor boats. After my 2.5 hours test, I felt so confident that the bag was doing a good job that I even took it off the kayak and submerged it briefly in the lake before pulling my kayak to shore and nothing got wet. I will continue to test this product mainly while kayaking in the Northeastern U.S. over the next few months. Most of my day expeditions will be done on Lake Zoar in Newton, CT, but hopefully, I will have a chance to do some longer kayaking trips over 2-3 days. I expect the temperatures to range from 70 F (21 C) to 90 F (32 C) and kayaking expeditions will generally range from 4 miles (7 km) to 35 miles (24 km). I will go out in most conditions with the exception of heavy downpours and I will kayak on class I rivers and lakes. I plan to continue to test this product by either tying it to the outside of my kayak or keeping it inside the cockpit with me. I will store various items inside the sack to determine if it does a good job keeping my things dry, and determine if the buckle and the closing seal continue to work well after extended use. So far, I like the weight, and the easy packability of the sack, the ample space provided for storage, and find that the graphic design is attractive and different from other sacks, which allows for easy identification. In the coming months, I will test this product to determine if it is waterproof, keeps the contents stored dry as advertised,and determine if the seal and buckle hold up to prolonged usage. I will also continue to analyze the fabric to determine if it holds up to the advertised durability. Since I am living in New York City and travelling to Connecticut on the weekends where my kayak is located, I am also using the dry sack to efficiently organize my travel bags and although not part of the official test series, I will comment on the practicality of the bag in this context. This concludes my initial report on the Outdoor Research 10L (610 cu in) Graphic Dry Sack. I would like to thank Outdoor Research and Backpackgeartest.org for allowing me the opportunity to test this dry sack. Please follow up for the results of my field tests in two months. I have used the Outdoor Research Graphic Dry Sack seven times over the last two months while kayaking in the lakes and rivers of the Northeast. The lakes were in the western part of Connecticut, and included Lake Zoar and Lillinonah Lake. Both of these lakes are segments of the Housatonic River. Each segment of the river is dammed on both ends, creating each lake. The kayaking trips ranged in length from 3 miles (5 km) to 9 miles (15 km), depending on the weather conditions which ranged from hot, humid, sunny days to less warm days with light breezes. Temperatures ranged from 75F (24C) to 90F (32C) with little or no current on most days and some light winds at most. The lakes, even with the dams open and the current flowing, were about a class I rating. In addition to using the dry sack for kayaking, I also used it to organize and transport my clothes in my travel bag on my trips between New York and Connecticut each weekend over the past two months. These trips involved seven roundtrip weekend trips and typically involved one hour of train travel and one hour of automobile travel. The clothing I would store traveling back and forth would include all my clothes going up to Connecticut on the weekend, and then on the way back, I would store my dirty or wet clothes from kayaking and or hiking in the bag, keeping them separate from the clean clothing, books, and groceries that I would often buy from the Connecticut supermarkets to transport back to New York City. Although my initial impression of the dry sack was that it seemed flimsy and too light, I must say that I am very impressed with the overall performance of the bag. The bag is lightweight, easily packable and has a good storage capacity. It fits all my clothes for a 2-3 day weekend trip with room to spare. For short kayaking excursions, it keeps an extra layer and essentials such as sunscreen, my lunch, and a first aid kit easily assessable and dry. The dry bag is well constructed and, to date, there have been no visible signs of wear at the seams. The graphics are still as attractive as the first day I received the bag. They have not faded, even slightly, even though the bag has been exposed to direct sunlight for hours at a time while strapped to the outside of my kayak. In fact, it is impossible to tell which side of the bag had been exposed while kayaking. The buckle closure has been very useful and is still latching tightly and consistently. The closure gives me some additional security knowing that if I buckle it around the strings on the hatch I will not lose my bag even if it should manage to slip loose. (See photo above). The bag may dangle and fall into the water, but I have peace of mind, knowing that the bag is still attached to the kayak. The bag comes with a D ring next to the buckle which is also a useful feature. I have not used it personally, but it does provide an additional option of securing the bag to a boat or kayak. The product has been a great alternative to my heavy rubberized dry sack which probably weighs 10 times as much, and is large and cumbersome to carry back and forth for short weekend trips. So far, the dry sack has done an excellent job of keeping my things dry. I also love the fact that the bag serves to compress my clothes and can be used as an organizer for my travel bag. The graphics on the bag is also very attractive and have retained the color even while being exposed in the sun for hours at a time. This concludes my field report. A Long Term Report will be appended to this report in approximatley two months from the date of this report. Please check back then for further information. I have used the dry sack for a total of 11 kayaking trips over the testing period. In addition to using the dry sack as a carrying device for my extra clothes, my lunch, and a headlamp, while kayaking, I also used it as a compression sack to carry two-three days worth of clothes back and forth from New York to Connecticut. I transport my things in a 20" duffel bag, and the dry sack helped to keep my things organized. In addition to my clothes, I generally carry a 35mm camera with accessories such as a spare battery, a small e-notebook with charger, a book or magazines to read on the train, and I usually end up bringing back a bag or two of groceries on my return trip on a regular weekend. In addition to the trips described in my Field Report, I used the dry sack on four more kayaking trips on Lake Zoar since October. The kayaking trips ranged in length from 3 miles (5 km) to 4 miles (6.4 km), with the temperatures ranging from 48F (9C) to 55F (13C) with little or no current on most days and some light winds at most. For the testing of the dry sack while kayaking, the sack was either strapped to the outside of my kayak as shown in the above photo or situated on the floor of the cockpit in between my legs. 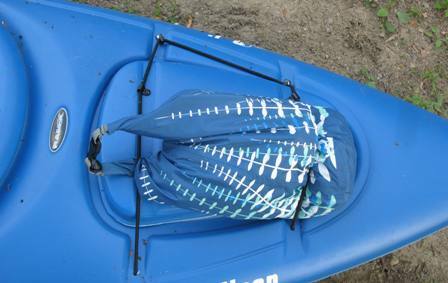 When the dry bag was strapped to the outside of the kayak, it was subject to splashing from the wake of passing motorized boats, and was also subject to some splashing from normal paddling. When it was left on the floor of the cockpit, it was subject to water which had pooled and was sloshing around from the splashing of the paddle. The pooled water would generally be about � inch (1.3 cm) high. The dry sack had performed so well over the test period that I decided to quickly submerge the bag in the river as I was exiting my kayak on two occasions to see if there would be any leakage. The instructions on the original packaging state that the bag is not made for prolonged submersion, but I wanted to see how the bag would perform in case it accidently had fallen overboard, so I quickly dunked the bag completely into the river then quickly pulled the bag out. In both cases, the contents of my bag remained completely dry. My impression of the dry sack has not changed from my initial impression. It is a lightweight attractive dry sack that did a great job of keeping my things dry while being splashed consistently with water over periods of 2-4 hours. It also kept my things dry while slightly submerged in small puddles, for periods of 2-4 hours. The bag served a dual purpose for me, and also worked great as a compression sack while traveling. When I squeezed the air out of the bag, my clothes for a 2-3 day weekend trip would compress down to the size of a basketball. The bag is well constructed, with nice watertight seams which show no signs of wear even after use over the past few months. The graphics on the dry sack have also held up well, even when being exposed to the sun for hours at a time. There has been no fading of the graphics and the graphics help me to quickly locate the sack while inside my traveling duffel. The Outdoor Research graphic dry sack is advertised as being lightweight, completely waterproof, and tear-resistant. I found that the sack performed as described and was impressed by the durability of the sack considering the weight of the fabric. The roll over flap felt a little flimsy as I stated in my initial impression, but the bag never leaked, and even when submerged, kept my things dry. The buckle worked flawlessly through the entire test period and was useful in securing the bag to the kayak by looping it through the strings on the hatch. Outdoor Research also offers a lifetime warranty on the product, and the product comes in a variety of sizes which makes it conveient to store anything from small items like maps to larger items such as sleeping bags. I have really enjoyed testing this product, and could not come up with any dislikes. I would like to thank both Outdoor Research and BackpackGearTest.org for allowing me the opportunity to test this item.